and the right side, which shows a communication dish and satellite. 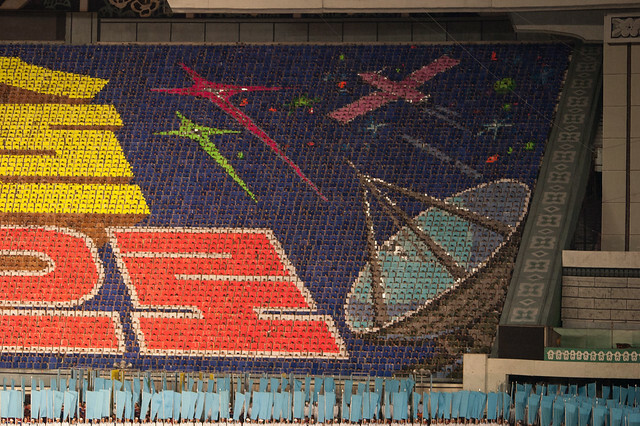 These pictures were taken at the Arirang Mass Games, which go on for months each year. 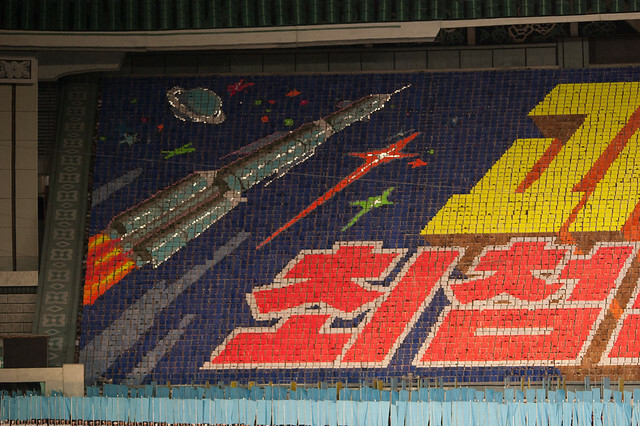 Although I believe that the last three pictures refer to the Kwangmyŏngsŏng-2 satellite, which was supposedly put into orbit earlier in 2009, it just shouldn’t be a surprise to anyone with even a casual understanding of the DPRK that they’d try this again this month. 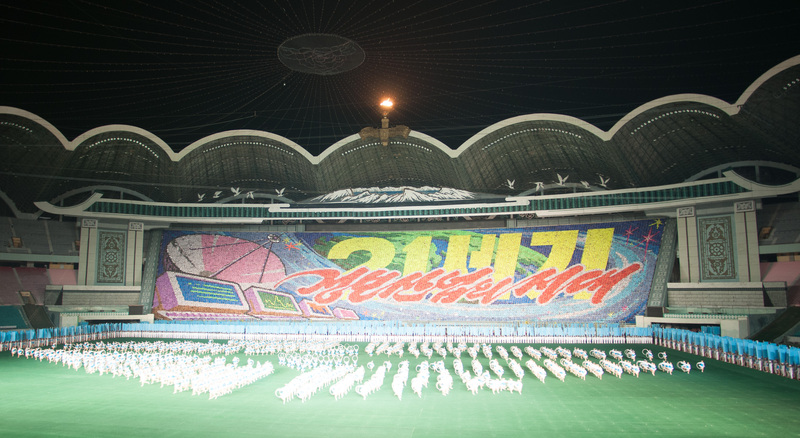 This is a society in many ways stuck in a cold war mentality, and firmly resolving around Kim Il-sung, whose hundredth birthday will be celebrated on April 15th. Take a look at the coverage of the event on the their WordPress blog and the official Korean News Agency* site. Quite frankly, I’d be astounded if they hadn’t planned such an event. *Their propaganda machine seems to be just a wee bit out-of-touch with the rest of the world. 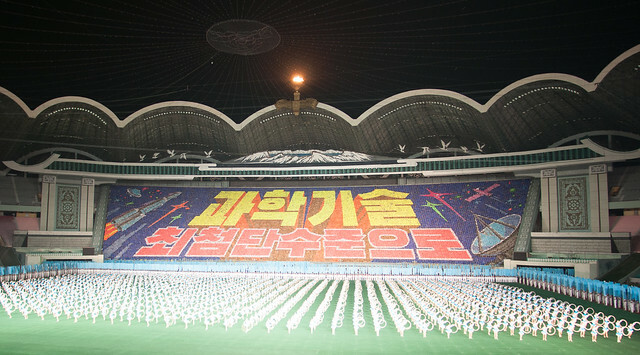 For example, the cited article lists support from Supreme Council of the Socialist Party of Romania, Malaysian Preparatory Committee for Commemorating the Centenary of the Birth of President Kim Il Sung (ain’t that a mouthful), and Nider Sachsen State Committee of the Communist Party of Germany. Which, of course, are just organizations in those countries, and don’t constitute state support by any means. And, this is out of the about 200 countries that now exist. 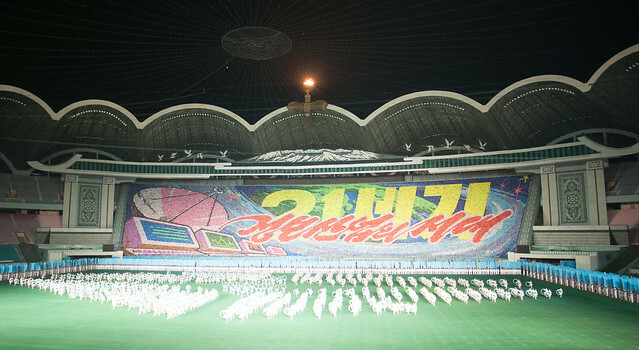 Posted in Americana, DPRK on 2012-04-3 by sujinyan.